Sun tea jars are very easy to find. Consider buying yours online after reading customer reviews. The big question is ... do you want a plastic or glass sun tea jar? There are other options on sun tea jars (spouts for dispensing, different glass colors, etc) but it will come down to how much you want to spend. 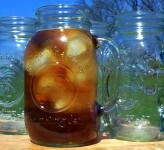 Consider buying a glass sun tea jar if you are looking for the best taste, longest lasting and easiest to clean option. I know it sounds like there would be no reason to buy a plastic jar after reading that, but it is just my experience with making sun tea. Most will say that 3-4 hours of great sunlight and air temprature helps you make a more consistant, better tasting sun tea when you use a glass jar. Also, there are many people uncomfortable with the unknowns of heating-cooling-heating plastic in general when liquids are involved. If you are looking for the lowest cost sun tea jar, look for a plastic one. You will be saving money in most cases, but may be making a sacrifice in other areas. There are more sun tea jars with spouts that are plastic as opposed to glass, so if that is an important factor and you do not have time to shop online, it may make sense for you. Plastic may also be the option for you if you are unsure if you will even like sun tea. Making sun tea is a bit of a process and requires some dilligence to do it correctly and safely. Many people who like bottled and traditional teas and want to pursue the prospect of making a tea on their own may find that it is not for them. Much easier to set aside the minimal plastic jar versus the more expensive glass sun tea jar.